This complex was built in the early 1880s for the South Australian Company, one of the most important commercial enterprises in the economic development of South Australia. Architect William McMinn was commissioned to design the 14 shops and hotel. By January 1880 the hotel of three storeys with dwelling accommodation had been finished. Construction proceeded from east to west, the section now occupied by Malcolm Reid being the last built, in about 1883. In his brief life McMinn showed himself to be competent in the Italianate manner as these buildings, together with the alterations for Samuel Way at Montefiore and the building at the corner of Ward Street and Lefevre Terrace, show. He also designed the romantic compositions of Mount Breckan, at Victor Harbor, and Marble Hill, which are unlike his other works. The part of the complex occupied by Malcolm Reid and Co was substantially altered for them in 1909, underscoring the success and expansion of the firm. 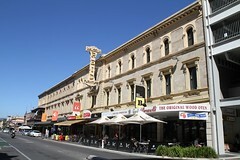 Malcolm Reid and Co had branches at Port Adelaide and Broken Hill and later opened establishments in Johannesburg and London, which indicates the part of the South Australian economy in world trade at this time. The completed range of buildings occupies almost two town acres. It is an unusually large and distinctive composition for Adelaide, comprehensive developments on such a scale being rare in South Australia. The buildings are well constructed of squared sandstone with stucco strings and surrounds to openings. The detailing, although typical of the boom period, is impressively carried out. The original composition was altered slightly by chamfering the corner to Bent Street and adding the tiered verandah/balcony to the hotel. The four shops west of the hotel are in remarkably original condition, while the hotel and the section occupied by Malcolm Reid have been painted. The Malcolm Reid store now has a continuous contemporary shopfront and the rear section has been virtually rebuilt. The accommodation at the rear of the Austral and the four adjoining shops are a good example of 19th-century terrace development with massive bluestone walling and brick dressings. This area is of historical significance for it's association with the South Australian Company and Malcolm Reid and Co. It is also of high aesthetic significance, forming an important element of the Rundle Streetscape. Australia, Vol. 1, 1909, p. 614, MLSA, Historical photographs (Town Acres 88 and 89).